The Devices dashboard tells you about the devices and servers that are being used to access your APIs. It lets you spot trends in how users are accessing your APIs. For instance, you might notice that traffic from one type of device is increasing, while another is going down, and then decide if the change requires any action or not. 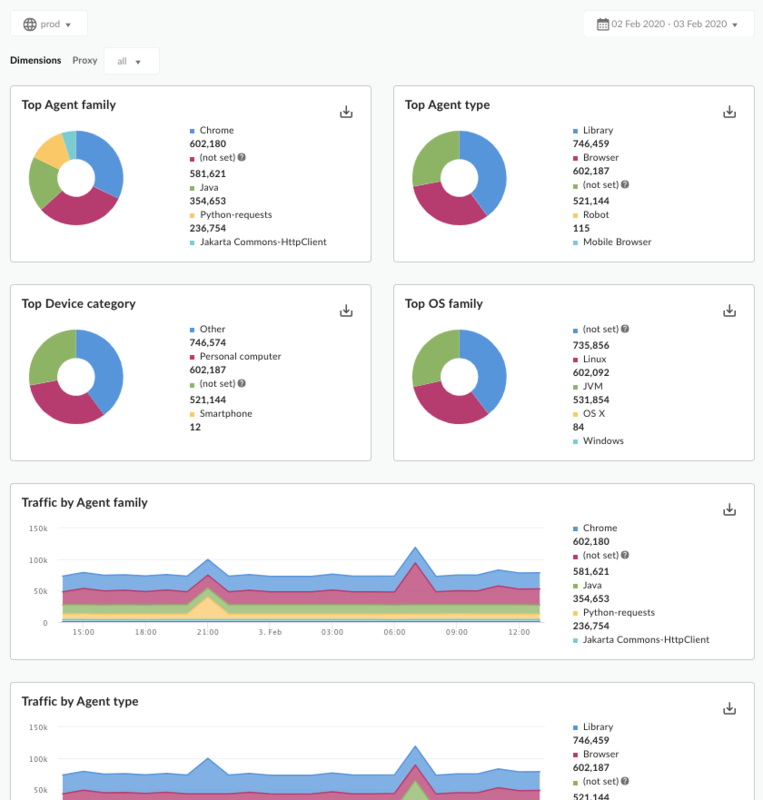 In addition to the following metrics, the dashboard shows the top platforms, agents, device types, and OS families. Traffic By Platform Measures how much traffic is coming from a specific application, like Google Chrome, Safari, Firefox, cURL, IE, and other platforms. Traffic By Agent Tells you if traffic is coming from a browser, a robot, a library, or other agents. Traffic By Device Type Tells you if traffic is coming from a PC, a mobile device, and other categories. You can view data for all API proxies in your organization, or you can use the Proxy drop-down to select individual APIs to analyze. When traffic origination cannot be determined, it is recorded as "Others".